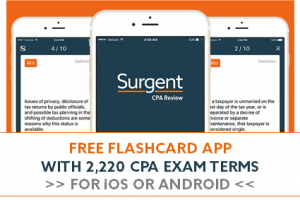 Now you can turn a few minutes of downtime into productive CPA Exam prep time with Surgent CPA Review’s free flashcard study app. Available for iOS and Android devices, the app comes with more than 2,200 CPA Exam terms and definitions in a simple, intuitive mobile app that you’ll have with you everywhere you go! Did you know that other CPA Review providers charge as much as $300 for their CPA Review flashcards? In fact, Surgent CPA Review is the only CPA Review provider that offers a full set of flashcards for all four parts of the CPA Exam completely free of charge. You don’t even have to be enrolled in our CPA Review course to use this amazing resource. Just download the app today and start studying! You’ll have a full set of flashcards with you all the time so you can use them whenever and wherever you have a few minutes to spare. You can randomize the 2,200 flashcards to help you make sure you really know all terms and concepts. This app is great for anyone — whether you’re already using the Surgent CPA Review course or not. The Surgent CPA Review app has a 5-star user rating in both the App Store and Google Play Store.